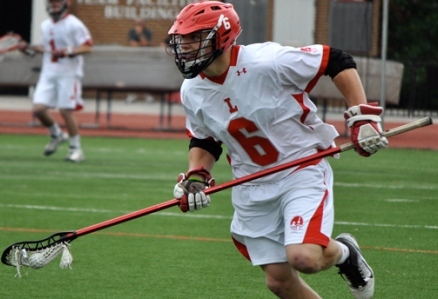 Joe Lisicky ’13 received All-America First Team honors on Tuesday as the United States Intercollegiate Lacrosse Association (USILA) announced the NCAA Division III All-American selections. Seniors Dylan Hoff and Andrew Wilfong each were named to the All-American Second Team while senior Franc Cook, senior Jon Lombardo, junior Pat Ohrem and junior Max Voumard all earned honorable mentions. Lisicky becomes the first LC men’s lacrosse player to earn First Team All-American after he captured the Old Dominion Athletic Conference Player of the Year and ODAC First Team honors. Helping lead one of the nation’s top defenses, Lisicky led the team in groundballs with 89 and caused turnovers totaling 41. He also chipped in five goals on the offensive end. Hoff scored 52 goals and assisted on 29 more to lead the ODAC in goals and points. He became the school’s all-time leader in points against Christopher Newport and finished his career with 251 points. Hoff also registered 11 hat-tricks on the year while being named to the All-ODAC First Team. An All-ODAC First Team selection in 2012, Wilfong started all 19 games and finished second on the team with 49 points including 28 goals and 21 assists. He scored two goals and tallied two assists in the win over Washington and Lee University in the ODAC Championship game. Picking up an All-American Honorable Mention selection, Cook was the ODAC Goalie of the Year after making 168 while allowing only 6.28 goals a game, the lowest in the conference. Lombardo, an All-ODAC First Team honoree, started every game this season, grabbing 49 groundballs and forcing 29 turnovers. Ohrem tallied 28 goals and collected 27 groundballs. Rounding out the honorable mentions, Voumard netted 28 goals and assisted on nine more. He also snagged 20 groundballs and caused 11 turnovers. Lynchburg was ranked as high as No.3 in the nation and finished the season with a 17-2 overall record.